Fulfilling our mission to protect and restore the Morro Bay estuary for people and wildlife requires a lot of hard work in the field. At the Estuary Program, that often entails doing research, restoration, and monitoring work out on the estuary and along the creeks that feed into it. Read on to see what we’ve been up to during the past month. 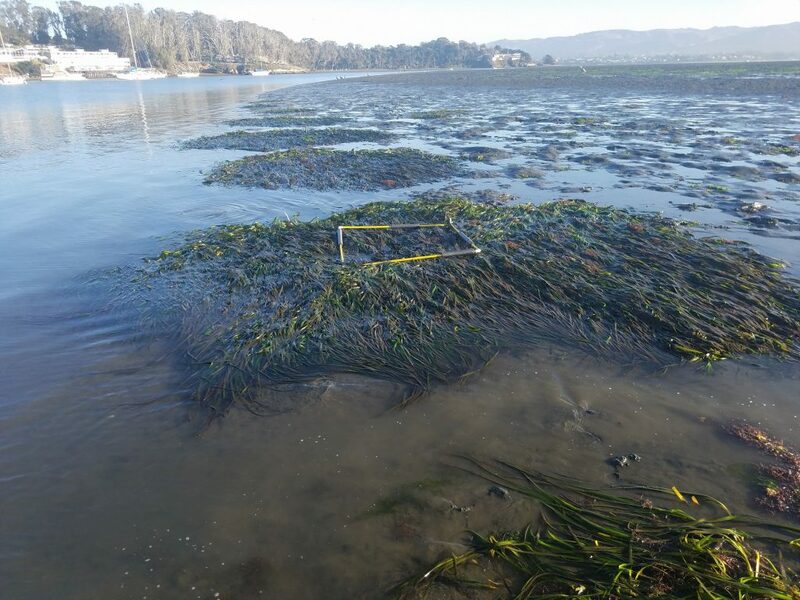 In November, we went out and checked on all of our 2018 eelgrass restoration plots, as well as some planted in 2017. 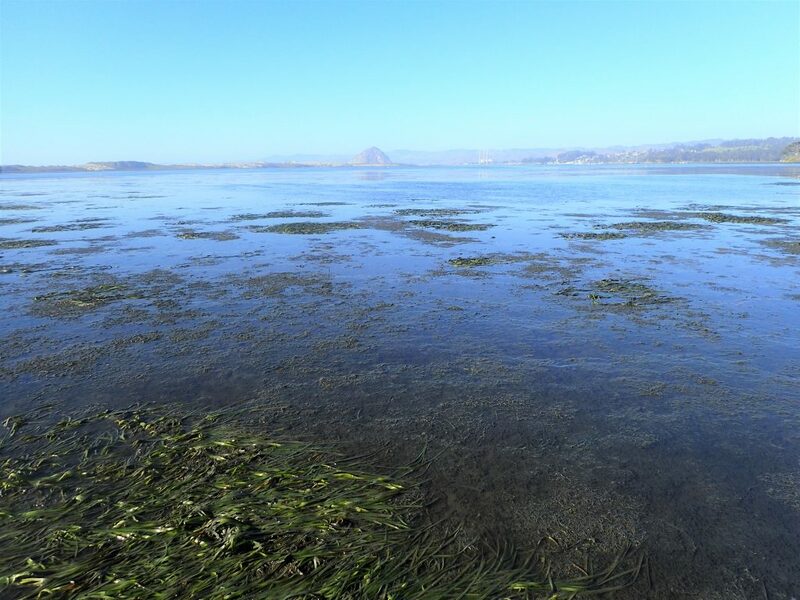 While we were out monitoring, we noticed lots of new patches of eelgrass in the forebay, midbay, and back bay. Most are small—in the one-meter by one-meter size range—but we did observe a few larger patches. Here, you can see around 20 patches of eelgrass off of Mitchell Drive. These patches are from natural recruitment, meaning that they began growing there on their own from seeds or from eelgrass rhizomes. These patches are not ones that we planted. You might remember that in August, we reported the restoration plots planted in the back bay were growing and still alive, but they did not look as good as the other plots. They had expanded from the original plot area, but not as much as the other plots. We checked on them again in November and were pleased to find that they have had exponential growth in just a few months. All the plots planted in 2018 have increased in density from the original number planted and have expanded beyond the original plot. Here is what one of the plots planted in March of 2017 looks like. The yellow square shows the original one-meter by one-meter planting area. 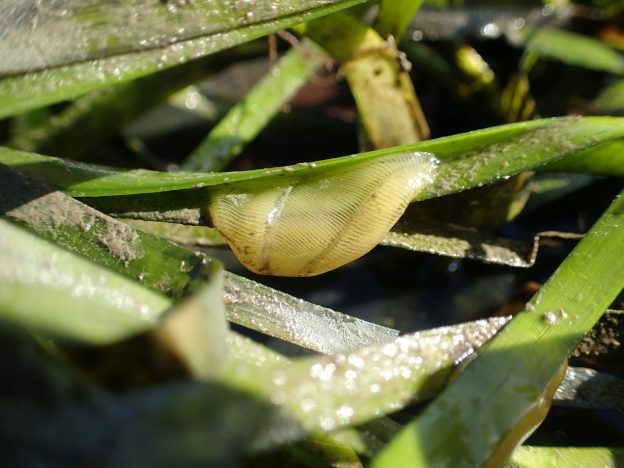 While our current eelgrass monitoring generally focuses on the density and length of eelgrass shoots within a plot, we try to document the different animals we find in the plots as well. We are also starting to record what species we see when we are out in the bay in order to track seasonal wildlife trends. Here is a list of species we spotted in November while out in the bay. Species marked with an asterisk (*) are ones that we saw inside of the restoration plots. 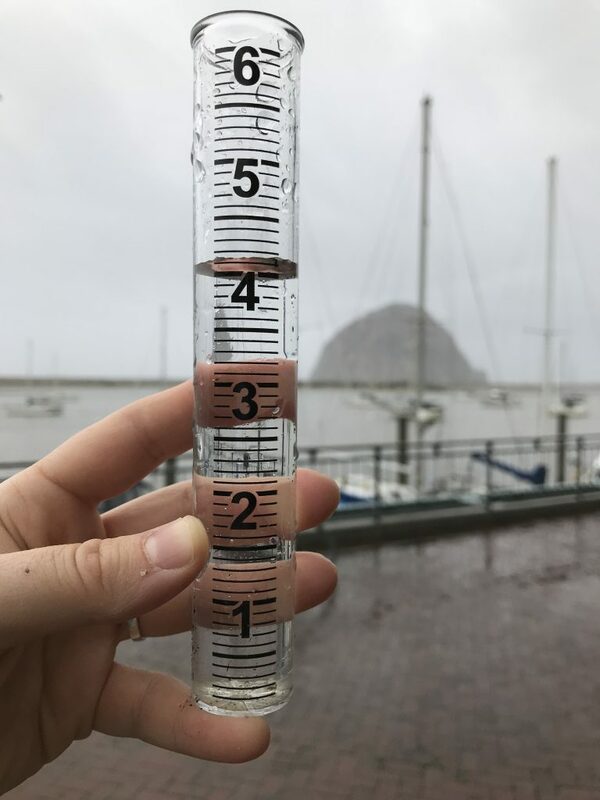 November rainfall ended up being more exciting than expected—one gauge by Dairy Creek recorded 4.53″ of rainfall for the month and the San Luis Obispo County gauge on Canet Road recorded 2.14″. According to John Lindsey, Cal Poly received 4.18″, which is nearly double the average for November. If you love watching the weather and you want to help the Estuary Program from home, please join our rain gauge network. All you need to do is place a rain gauge in an open area of your yard or garden and then, go to MBNEP.org/rain and enter the amount of rain your gauge collects after each storm. You’ll be helping us see how much rain falls across different areas of the Morro Bay watershed. If you don’t have a rain gauge, just stop by our office and pick one up for free. We’re at 601 Embarcadero, in Morro Bay. Just head up the stairs and into Suite 11 on the bay-side of the building. This photograph is from the big storm in March of 2018, when we received more than four inches of rain in a twenty-four hour period. Pick up your rain gauge now so that you’re ready for the next round of winter and spring storms.